I wanted to post this recipe before it got too warm and everyone was searching for salads. Our weather is finally beginning to warm up but the nights are still quite cool and this makes for a nice warming dinner. I love soul food or comfort food like this. My mother used to make an Indian version of this dish especially for me because I loved it so much as a youngster too. It was a lot spicier and had Indian spices but it was just as comforting and satisfying as this Southern and Mid Western one. I have yet to make her version and when I do I will share it. My usual recipe for chicken and dumplings is made with the fluffy biscuit dough balls. Then I saw Cooks Country on PBS one weekend and their version with the flat noodles. It looked SO good and more than anything, it reminded me of my mother’s. In true Cook’s Illustrated fashion, it’s an involved recipe with many steps to get the best Chicken and Slicks ever. The first time I made this, I didn’t have time for the Cook’s Illustrated version. I needed to make dinner and quickly, so I took a few liberties. It turned out really well and now, I just make it my way. If you would like to try the Cook’s Country version, you can find it here. One day when I have planned my day and am super organised to have time to try their version, I will and compare it to mine; till then I’ll use my shortcut. It is best made with fresh chicken broth and chicken, but in a crunch, I don’t see why a good quality store bought chicken broth and rotisserie chicken can’t be used? Either way, if you like unfussy, simple, homestyle food, you will absolutely love this. 1 cup/236mL chicken broth, approx, may not need all. I usually make my chicken broth in the pressure cooker because I am not organised enough to think ahead. I throw all the chicken broth ingredients into my 8qt cooker, cover with water, making sure it only comes ⅔ of the way up the cooker, and pressure cook for 30 minutes. After the broth is done, remove the chicken and let cool and then shred. Strain the broth and reserve to use in the stew. Once the broth is strained, you will see some of the chicken fat floating on top. Skim this fat to use in the slicks. You will need about 3 tablespoons. In a food processor or a mixer fitted with a paddle, add the flour, salt, vegetable oil and chicken fat. Run the processor and rub the fats into the flour. Slowly add a ½ cup broth and begin to form a dough. You will need to add the other ½ cup as needed. I needed a whole cup but it is dry here and the flour absorbs more liquid. You want a nice soft dough that can be rolled out thin. Once you get a soft dough, cut in half or even quarters, and roll out the pieces one at a time. You want to roll it out fairly thin since that's how thin your noodles will be. Use a pizza cutter to cut the noodles out. Thin or wide, your choice. I made mine medium shape and size. They are easier to eat if they are manageable. Roll out all the pieces and cut into noodles and let dry on a baking sheet. Bring the 10 cups of broth up to a simmer and add the celery and carrots. Slowly add the noodles and stir gently to make sure they don't stick. Simmer the noodles in the broth till done, about 10-15 minutes. Add the 2 tablespoons of flour into a bowl and add a half cup water to make a slurry. Add this to the pot to thicken the stew. Add the parsley, check for seasoning and serve. You could probably use a pasta roller if you have one, unfortunately for me, mine got left behind in my move from Houston. Rolling the dough isn't hard and you can roll and make the noodles in 30 minutes. So, this will probably be my last winter type stew for this season. Though I can eat stews in the summer time too! I just can’t eat salads in the winter for some reason. I am looking forward to our spring season and the farmers’ markets. I can’t wait to get out there and see what’s available. Before I go, I wanted to share some news; I was invited to join the Culinary Content Network featured on The Daily Meal. For those not familiar with The Daily Meal, it is an online resource for all things food. It’s a great site and if you haven’t checked it out, scroll down and click on the banner in my footer. It has so much great information and a section with content from invited bloggers; The Culinary Content Network. I hope that you will check my stuff out there soon! Unfussy simple homestyle food? YES PLEASE. This is completely up my alley Nazneen, I love the flavours in this! I could definitely do with a warmign bowl of that right now, yum! Congrats! This looks so inviting! Thanks Ameena! They are delicious! This looks like perfect comfort food. Yumminess all the way! Thanks Nik, I love dishes like this, warm and filling. I have no idea what slicks are (now I do!) and it may be too warm already for soup but, boy, does this look appetizing! Just the kind of comfort food I need right now. It is comfort food indeed! I hope you are feeling better. First time I heard of slicks, this sounds delicious! Thanks Raymund! They are sooo good! For a Chicken and Slicks looking this good, I don’t really mind it even the weather is a bit hot. This will always be comfort food to me. 🙂 Thanks for sharing your short cut version. This is especially good for weeknight meals. Wish you a great weekend. I know Amy! I never stick to cooking with the seasons! I make more soup in ten summer than in the winter and my kids always complain! Congratulations, my friend. I’ll surely check out your content. Never heard of slicks before but the dish looks very delicious. A comfort food indeed. Thanks Lail! I hadn’t heard of slicks before either but I had eaten them! I just called them dumplings. They are really good though. This recipe spells “comfort food” from a mile! Congrats to you too then! It is a very comforting meal. I’m wondering when the weather will remain consistent…but ’til then, I wouldn’t be bothered by snuggling up with a biiiig ole mug of this! and CONGRATS!! Thanks Angela! I know what you mean, it’s been really weird weathered here but we’re used to it, The Rockies create havoc with the weather. Nazneen – this look amazing! My Grandmother did a flat version as well and wow – this recipe brought back home! I may have to make it now! Thank you! Thanks Kimberly for stopping by! I am so glad it bought back some happy memories for you. Food does that to me all the time. I love this dish! Hadn’t heard this sort of dumpling called slicks before – great name. I usually add a bit of baking powder to my dumplings. They don’t actually rise all that much, but it makes them a bit lighter. Really good post – thanks so much. I hadn’t either until I watched that episode. I knew dumplings and that’s it, and the Indian word which is also very cool, suthriyan. I think they are wonderfully fitting words or these slick noodles! I add bp to my round dumplings, these ones don’t need it. Thanks John! Well thank you Karen! That is high praise indeed! Cook Country dishes are awesome. That looks like a lovely warming dish…perfect for me as we’re heading to winter in Australia! Yes! I was thinking of all my Aussie buddies as I was posting this. I hope you can make it one day when it’s cold. This sounds like a great, comforting meal, Nazneen. You’re so right about Cook’s County recipe’s but they sure are good! Congratulations, too, are in order. This is really good — and well-deserved — news! Thanks John! I love Cooks Illustrated and cook their recipes often….when I have time. They are a bit involved but if you aren’t in a hurry, they are fantastic. This is real comfort food, looks delicious! Thank you Daniela for stopping by and leaving a comment! I appreciate it! 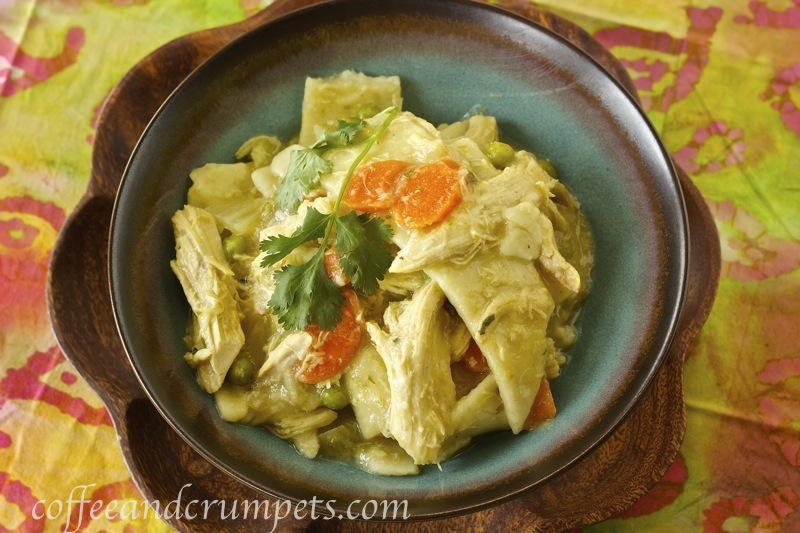 I love chicken & dumplings, and then looks awesome! I love that you used turmeric in this. Bookmarking it for next winter! Thanks Lori. I like to use turmeric because its a natural antiseptic, takes care of chicken yuck and also, adds a a nice yellow hue to the broth. Thanks for stopping by! Thanks Abby! Thanks for stopping by and leaving a comment. Loving your beautiful recipe and photos as always! Thanks Uru, you are very sweet. Great, Francesca! I hope you enjoy them, they are so good esp, when its cold. Congratulations Nazneen! Your blog so belongs there. I love this…though I must admit dumplings are not my strong points. But this is worth a try. Or maybe you could parcel me a plate of that gorgeous looking stew…. Thanks Minnie! Have so, they’re not too hard. Just have to roll some dough. It looks so comforting and delicious. Congratulations, you deserve it! I absolutely love this dish, so filling yet not too heavy! Thanks Lin! It’s a great dish for cold weather. Fills you up nicely. Yep. That’s the other name for them. They are very filling and really great for hungry kids. My 7 year old loved them, he had two bowls. Nazneen: How interesting!!! This is a stewed salad…It looks delish as everything else that you make. I am glad that the weather in Colorado started to change and getting a little warmer. Have a great week, my friend!!! Thanks Denise! It sure feels nice to have beautiful blue skies, but then it begins to rain! Thanks GG. Those noodles are really good! You can’t beat homemade pasta or noodles, their texture, flavour, everything is wonderful.